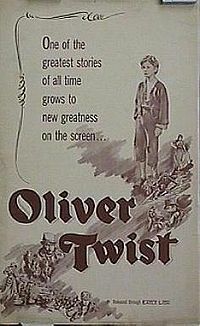 Oliver Twist (1948) is the second of David Lean's two film adaptations of Charles Dickens novels. Following the success of his 1946 version of Great Expectations, Lean re-assembled much of the same team for his next film, including producers Ronald Neame and Anthony Havelock-Allan, cinematographer Guy Green, designer John Bryan and editor Jack Harris. Lean's then-wife, Kay Walsh, who had collaborated on the screenplay for Great Expectations, played the role of Nancy.